Image: Image: Pool/Samir Hussein/Getty Images. Design: Ashley Britton/SheKnows. With the clock ticking down on the royal baby’s arrival, sources say Meghan Markle is feeling nervous in her third trimester. It’s understandable that the Duchess of Sussex might have some anxieties surrounding the birth of her child. 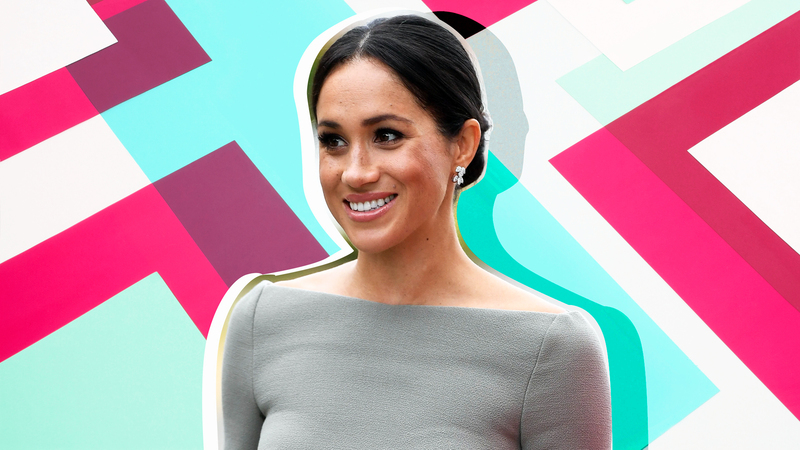 After all, she’s got a lot to think about, like her plan to return to her royal duties full-time shortly after delivery, whether she and Harry will give their child the title of prince or princess, and who to invite to her second baby shower. To top it all off, she has to continue serving up her best pregnancy looks and making a great impression on the world. That’s a lot to handle for any one person! Of course, you don’t have to be a royal to experience pre-pregnancy jitters; in fact, having some nerves is entirely reasonable. You are, after all, going through one of the most significant physical and emotional life changes you may ever experience. However, the majority of women (52%) reported that they suffered increased anxiety or depression during pregnancy, according to a 2009 survey from the Anxiety and Depression Association of America. Another study published in BMC Pregnancy and Childbirth surveyed hundreds of women during and after their pregnancies and found that those who reported being fearful were more likely to experience more intense labor pains and “a negative experience of birth” than those who didn’t. The good news is you don’t have to live in fear during your third trimester. While you should always consult with your doctor for personalized recommendations, we’ve gathered some useful tips from health professionals and parenting experts on how to reduce stress — and dare we say, enjoy — your third trimester. Communicating your feelings and concerns is one of the best ways to address your fears, says Kecia Gaither, MD, MPH, FACOG. This advice may sound simple, but some women may find that even talking about their anxieties can be stressful. Consider jotting down your thoughts in a journal, so that you can easily access them during conversations. If needed, you can pass the journal to your practitioner, partner, or friend, so you don’t have to talk at all until you feel prepared. Remember: None of your thoughts or concerns are silly, and it’s vital that you’re as transparent with your doctor as possible. Also, know that you don’t have to take or listen to anyone’s advice (unless medically necessary) if you’re uncomfortable or overwhelmed. People may try to tell you their birth horror stories or give you all sorts of unsolicited advice about your diet, your birthing method, or a million other things that don’t concern them. It’s more than OK to say you’re not interested. Every pregnancy is going to come with some surprises, no matter how much you plan. But spending the time researching and preparing your options well before your due date may alleviate some stress, says Lamaze Certified Childbirth Educator Katie Griffin, RN. Additionally, expecting parents should consider joining a childbirth education class, says Genevieve Howland, founder of MamaNatural.com and author of The Mama Natural Week-by-Week Guide to Pregnancy and Childbirth. You may also want to research doulas, midwives, and alternative birth options to know the kinds of services and care available. Try as you might, you won’t be able to control every aspect of your pregnancy. Acknowledging that — and coming up with healthy coping mechanisms — will reduce your stress, says perinatal mental health expert Kirsten Brunner, MA, LPC. Some of these coping tools may seem more difficult once labor pains kick in. Griffin also recommends pregnant folks prepare for these pains ahead of time — through Lamaze classes and various breathing techniques, stretches, and more — and practice them regularly. “This enables you to use the skills effectively during labor to decrease pain during contractions,” she says. Feel empowered to ask for help in other areas, as well, whether you need help assembling the nursery, cooking meals, cleaning the house, or taking care of pets or your older children. Registered Dietician Nutritionist Meredith Price, MS, RD, CDN stresses that women must continue to take care of their bodies in the third trimester to maintain their physical and emotional health. One way to do this is to be mindful of what you eat. And now would be a great time to stock up on must-have pregnancy items like comfy shoes, belly bands, and supportive pillows. Of course, eating is only one part of the equation. Price says the third trimester can also usher in “painful and chronic constipation.” To combat this annoying symptom, she recommends women drink a lot of water, get plenty of exercise (prenatal yoga and Pilates are two of her favorites), and eat high-fiber foods such as nuts, berries, and lentils. So take some time for you, and just remember: You’ve got this, mama.